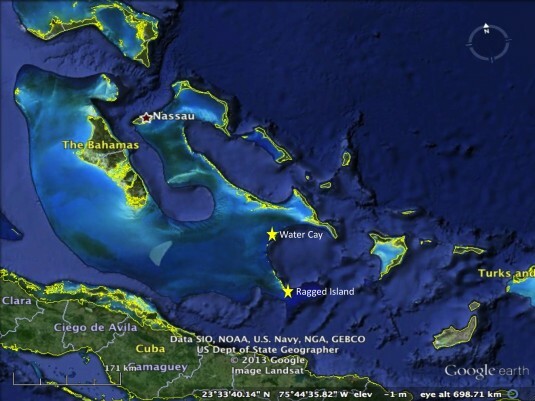 Ragged Island and Jumento Cays surveys – check! This year’s conch surveys took us to a remote location in the southern Bahamas, the Ragged Island and Jumento Cays (R/Js) chain. Ragged Island, just 60+ miles from Cuba lies at the southern end of the chain and is inhabited by a small, resourceful Bahamian community known as Duncan Town. The rest of the islands, cays, and rocks in this long archipelago, which stretch north in an arc over 100 miles long, are only home to the abundant wildlife above and below the sea. The Ragged Island and Jumento Cays chain in the southern Bahamas. 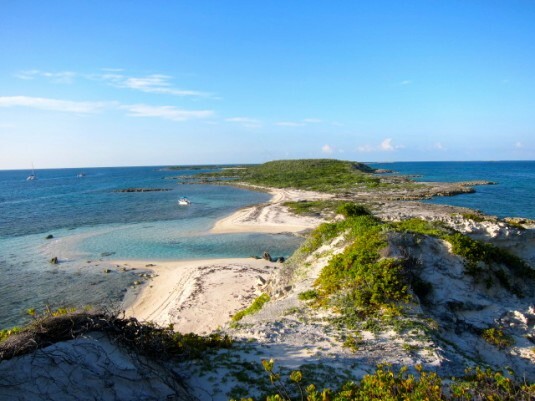 Water Cay is the largest cay closest to Long Island and Little Exuma. 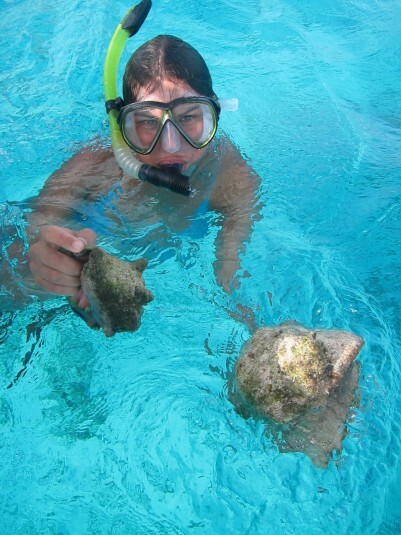 Ragged Island is just 60 miles from the northeastern shore of Cuba. 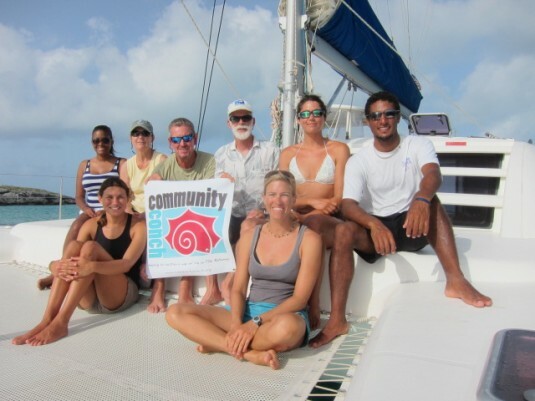 Our initial goal for survey of the R/Js, was to survey both the extensive shallow bank on the western side of the islands, and also try to get a good idea of what conch populations looked like in the deeper water on the eastern side of the chain. It’s always good to have a plan, but we’ve learned to be flexible when it comes to the weather. After only two days of surveys, we decided it was too windy, and therefore too rough to continue exploring the deeper shelf side. Instead, we focused on the very productive banks. It was sharky out there too! A view of narrow Water Cay from the top. We started surveys of the deeper waters (right side of the island), but ended up with more extensive surveys of the shallows (left side of the island). 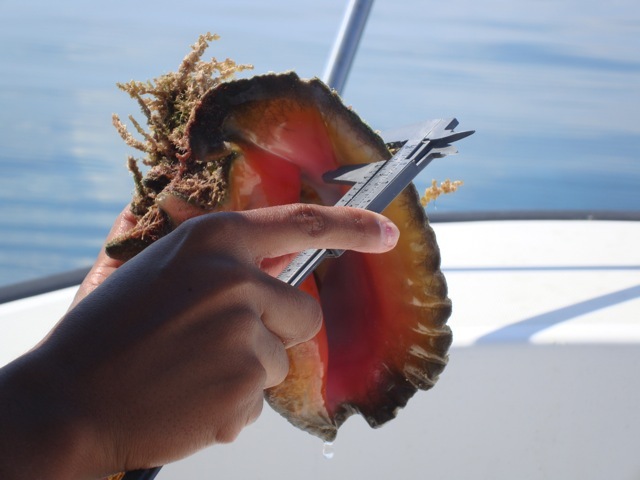 All of the information we got from the Department of Marine Resources and fishermen indicated that most of the conchs were found in the shallower waters, so we felt sure we were going to find some. As we worked our way down the islands from Water Cay, staying a night or two in the few protected anchorages we could find, we were amazed at the numbers we were seeing. It was not unusual for us to count 100+ conch on a single transect tow, which translates into high densities and healthy reproductive populations. Jessica Minns brings 3 conch to the boat to be measured after a tow. Getting shell length and lip thickness measurements help us to determine the age structure of a conch population. We had a great crew of volunteers this year. They were so capable and so brave to do the hard work that needed to be done in this remote location. Getting in and out of the water all day, every day, trying to avoid the barracudas and sharks, bouncing along in a small boat in rough conditions, and free-diving sometimes up to 40 feet to retrieve conchs for measuring…all for conchservation! At the end, everyone appreciated what the life of a fisherman must be like; except for the part where you get to sell your catch! More mini-reports coming soon! Looks like a wonderful trip! We look forward to hearing more details. Thanks for all your good work, Catherine and crew!